Free run, accompanied session or intensive development lessons ! Waterski There are 4 products. Water Skiing in bay of Angels, one of the best place in France for watersports ! 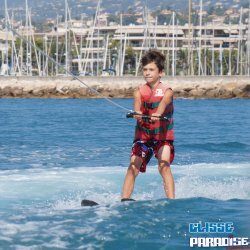 Near Nice and Antibes in French Riviera, Glisse Paradise Watersports offers nautical activities during your holidays. Exceptional lake ! We have one of the best locations for watersports. The Nice Cote d'Azur airport is the perfect shelter to prevent the sea to become to wavy. 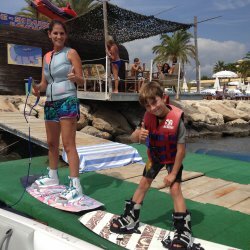 With an instructor by the side of your child in the water, we will assure your child's safety and improvement during his/her first ever waterski or wakeboard run. Water as flat as land !